With four full-time clock repairmen on staff, we’re always ready to service your clock to keep it at it’s highest level of performance. Our retail store, including the repair department is open seven days a week. 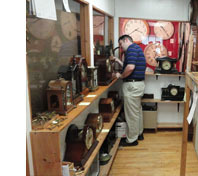 Our experts service new and antique clocks, including Howard Miller, Ridgeway, Hermle, Sligh, Kieninger, Ansonia, Seth Thomas, Gilbert, E.N. Welch, Sessions, Waterbury, Hershede, New Haven, Colonial, & Chelsea. 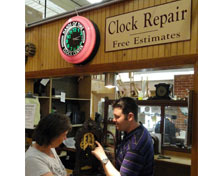 As a full service clock center, Hands of Time provides expert repair services including routine maintenance, overhaul and complete restoration of vintage and antique clocks. All our overhaul repairs include a one-year warranty. 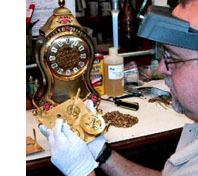 We make housecalls for in-home service of grandfather clocks, which includes topically cleaning, lubricating and oiling the clock movement along with making all necessary adjustments. We finish the job by regulating and balancing the clock to insure accurate timekeeping.